Vegetable soups are quickly becoming my savior as I enter my first, cold New York winter. I used to bring salads to work in Los Angeles year-round and they proved sufficient for a quick meal at my desk. I tried that here in New York during the first few weeks of November and it turned out to be less than satisfying. So much so that when faced with the green leaves staring back at me from the office refrigerator, I quickly turned and walked out the door in search of something warm and a bit more comforting. The main problem with my new lunchtime ritual is the detrimental effect it has had on the snugness of my wardrobe. Add that to the battle already underway with the culinary school bulge and it is a recipe for disaster. One more trip to Guy & Gallard for lobster bisque and no amount of Saturday morning boot camp in Central Park is going to bring me back. Enter the humble vegetable soup. This is the perfect comfort food compromise. It is warm, thick and packed with the flavors of fall, but if you keep the ingredients to vegetables, stock and a few key flavorings, it is supremely healthy and nourishing. 1. Sauté diced onions in a bit of oil. After the onions soften add any garlic, ginger or other such flavorings (not herbs) and sauté a bit more. Season with salt and pepper. 2. For a roasted vegetable soup, dice the vegetables and roast at 375˚ until tender. Alternately, you can add the vegetables to the pot with the onions and sauté a bit to achieve some color. If roasting, add the vegetables to the pot with the softened onions after roasting. 3. Add enough vegetable stock to cover everything, toss in any herbs you want to use and simmer for at least 30 minutes. If you did not roast the vegetables, make sure they are tender before proceeding. 4. Remove the herbs and use an immersion blender or a standard blender to purée the soup. 5. Return the puréed soup to the pan and season to taste with salt and pepper. There. You just made delicious and healthy vegetable soup. The only thing I must insist on is that you, if at all possible, make your own vegetable stock. It is so simple, yet it adds so much to the final product. Not to mention that it is a great way to use up vegetable scraps. For a refresher on vegetable stock, go here. If you are not quite ready to experiment on your own, here is the recipe for my latest concoction, carrot ginger pear soup. Heat a medium pot over medium high heat. Add the oil and diced onion and sauté until soft. Add the ginger slices and continue to sauté. While the onions are sautéing, peel and roughly chop the carrots and pears. Add the carrots and pears to the pot and sauté until beginning to soften, five to 10 minutes. Season with salt and pepper. Add enough stock to cover the vegetables and simmer for 30 minutes until the carrots are tender. To temper the spice of the ginger, remove the slices before pureeing. If you want more zip, leave the ginger in. Purée the mixture using an immersion or standard blender. Return the purée to the pot and season with salt and pepper to taste. If the soup is too thick, add a bit more vegetable stock to thin it out. Serve or cool and divide into containers for storage. Marvellous! I must say that I miss your recipes become rare...Kisses! Excellent forumla. Anyone should be able to follow this and create a healthy, quick lunch. I use a similar formula... though I must admit that most of the time I'm making tomato soup. I should probably start to branch out a bit :) What other combos have you used? I love a nice simple vegetable soup, but carrot ginger pear...now that's special. Yum. 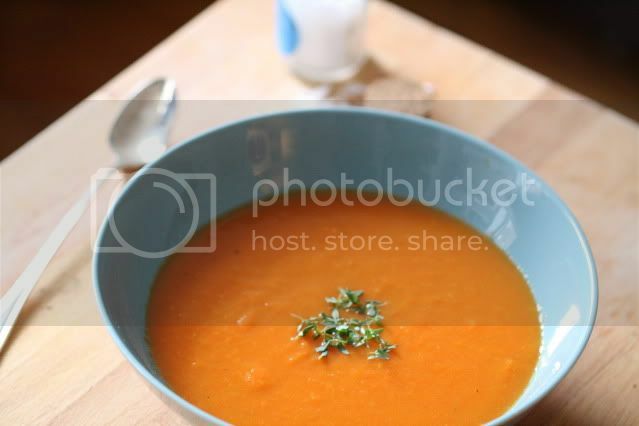 Its consistently 30 in Paris right now and this sounds like a great healthy, bright and comforting little lunch soup!! I know you're right about veggie stocks, and im a HUGE supporter of everything from scratch, but unless I'm cooking for others I'm too lazzzzy. Don't you wish you could buy a beautiful homemade one from a little deli just outside your apartment? God that would be great. Also, love the duck carcass tip.